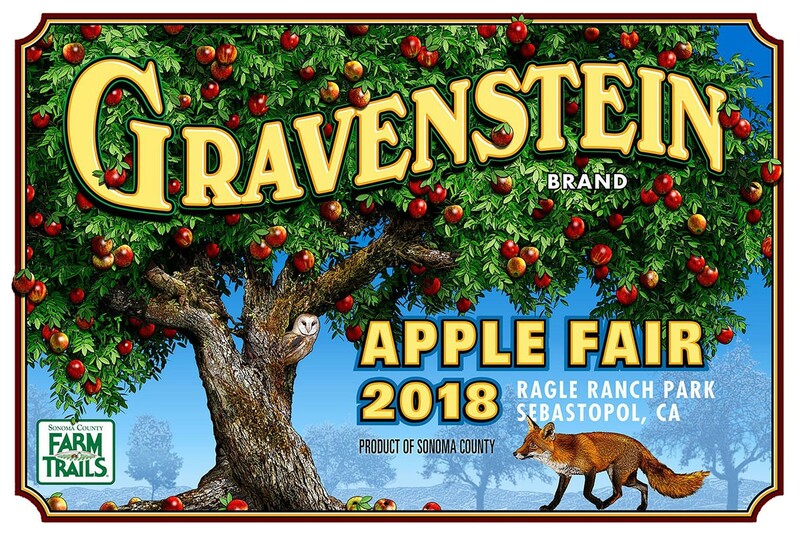 Gravenstein Apple Fair, Saturday, Aug. 11, and Sunday, Aug. 12, Ragle Ranch Park, Sebastopol. 10am–6pm. Tickets, $15; seniors (65-plus), veterans, bike riders, $12; children 6–12, $10. Artisan Tasting Lounge, 11am–6pm; $20 plus fair admission. 707.837.8896. LIKE A FOX IN THE HENHOUSE Sebastopol's Gravenstein Apple Fair again showcases the growing vaiety of local ciders and apple-inspired food. A harvest fair on the second weekend of August? It does seem early, at a time of the year when gardeners in many parts of the North Bay are lucky to pluck a sun-ripened red tomato or two from the vine, and vineyards are still full of sour, green grapes. Yet the timing's just right for what organizers of the Gravenstein Apple Fair call the "sweetest little fair in Sonoma County." The Grav is an early-ripening apple, as a quick tour of Sebastopol back roads this week will demonstrate. See the four-by-four bins—some, new white plastic; some, weathered old plywood holding up against the years—alongside a tractor or two staged in an orchard. Over here, a thicket of wooden poles holds up three limbs groaning with fruit. There, a picker on a tall ladder tucks apples into a big bag slung over her shoulder. And everywhere, that telltale aroma, as the signature apple of Sonoma County is the first to fall from the tree in late summer, is just beginning to waft about: apples turning from green to red to brown on the hot, dusty Goldridge ground. It's tempting to say the Gravenstein is like the Pinot Noir of local pomes—tender, it bruises easily and doesn't ship like other often less flavorful commercial varieties—if it wasn't for the bad sap between the two, after apple trees were ripped up and burned in great piles by the thousands and replaced by grapevines in the 1990s. So maybe the Zinfandel of apples? The Gravenstein apple, native of Denmark, reportedly arrived on the shores of the Sonoma Coast with Russian settlers and, although less obscure worldwide than Zinfandel, reached heights of popularity in Sebastopol, California, one-time Gravenstein apple capital of the world. The Apple Fair, though celebrating 45 years on Aug. 11 and 12 this year, is kind of a late arriver, created by Sonoma County Farm Trails as its main fundraiser supporting local agriculture, while celebrating the holdouts among this heritage apple. Now the Gravenstein is enjoying a second act as the star apple of local craft cider. Two centuries after the Russian colony at Fort Ross was established, way back in 2012, Tilted Shed cider makers Ellen Cavalli and Scott Heath launched their ciders at the fair, but were squeezed into a corner of the wine tent. The next year it was dubbed the wine and cider tent, and in 2015 they got their own cider tent, which this year features the boozy beverage with terroir and a kick from 17 local producers. The fair keeps cider, wine and microbrew in their respective tents, available by the glass ticket at $6 per ticket, but a funny thing crops up on the way to the ticket stand: an extra $20 buys entry to the oak-shaded oasis of the Artisan Tasting Lounge. Here, beer, cider, wine and craft spirits are poured alongside cheese and nibbles from the likes of Redwood Hill Farm, Moonlight Brewing, Spirit Works—and look, over here is Michele Anna Jordan with an apple-inspired treat. Sip Heidrun Meadery's bee-friendly tipple, spy Eye Cyder from the latest converts to Johnny Appleseed, cult winemakers Radio-Coteau, and then go round again. There are so many purveyors in this space, in fact, they've got them working in shifts—i.e., not all spirits, cheese and cider businesses on the list will be there at once. But there's no crowd to wait for the next taste. Conducting an investigation into the amenities of the Artisan Tasting Lounge on the last day of the fair, 2017, our Bohemian reporter found it difficult to leave the Artisan Tasting Lounge. Why venture out? To pet the llamas and baby goats, of course. More hands-on opportunities available for cow milking at 12:30 daily; look and learn how to do sheep shearing right at 4:30. A full schedule of the Agrarian Games, née Farmer Olympics, sponsored by Community Alliance with Family Farmers and Farmers Guild, offers the hayseed advantage in such contests as the potato-sack race, hay-bale toss, watermelon-seed spitting, compost relay and . . . chicken-poop bingo. So then, back to the food. Get there early and beat the long line for grandma's apple fritters, a fair fave since 1986, when they cost 25 cents. The recipe for grandma's fritters is closely guarded by the Masonic Goldridge Order of Eastern Star, so maybe don't ask. A vendor new to the fair this year, Clint McKay offers a sweet take on his traditional Pomo Indian food with fry cake apple shortcake. Non-apple-related foodstuffs also abound, including Estero Café's all-local version of an American summer fair standby: the corn dog, made with local dog, corn and all. But just to remind us that it's all about the apples, the fair allows shoppers free 30-minute admittance to the fair just to make a beeline for a box of apples from local grower Lee Walker. Get them apples!